Besides allowing us to search things all over the internet, Google's search engine is now able to show us results from our own personal content. When you search on Google, you can already select if you want to see images, videos, news, etc. 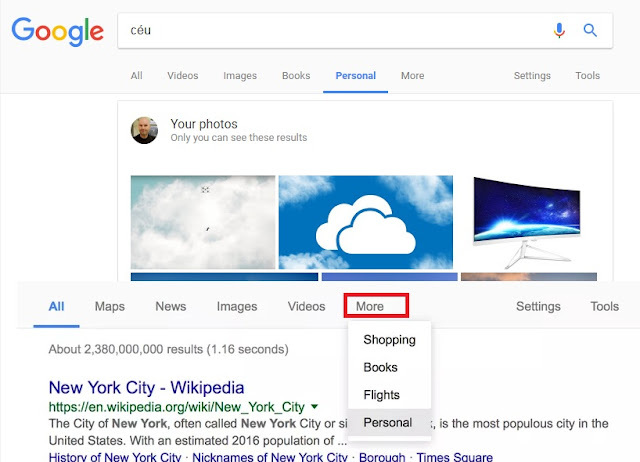 Now we get an extra option to those results: a new "Personal" category (which can be accessed through "more") and presents us results from things we keep in various Google services, such as Gmail, Google Photos , Google Drive, etc. No one doubts that using Google's services gives them an insane amount of information. The emails alone would allow them to figure out a lot about ourselves, and considering they also get our photos, and even our location (if we give them permission), then it's difficult to imagine all the ways all this information can be analyzed.